Create~Connect~Conquer! This is a worldwide social network and unique online community for any type of gamer. Join the revolution and setup your FREE profile today! Looking for video game tournaments? Perhaps you\'re organizing an online or live gaming event? Tournament Seeker is a unique new resource dedicated to eSports! No matter the video game, let's discuss! So you're a proud member of this unique and growing video game community and now you're wanting some cool gamer apparel to spice up your own gaming world? Maybe you're looking for a fun gift for that other gamer in your life? The GoG Shop can help! Listen (and watch) as we welcome so many special guests this season! GoG members, pro gamers, clan organizations, & game developers join the unique conversations! 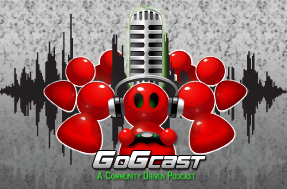 Each and every episode (around an hour each) from all four seasons can be heard with our dedicated GoGcast Player, on iTunes, over on Blip.tv, or by downloading the actual files. Read show descriptions, get involved as an upcoming guest, and connect with community discussions surrounding each and every show. Are you trying to join us, but your verification email hasn't arrived in your inbox? Check your bulk folders and if it still hasn't came through after 24 hours, email contact@GatheringofGamers.com with your username and we'll help you get setup! Look towards the buttom of your screen while you're logged in and say hi to someone who's online. Setup a chatroom and get the conversations growing! The GoG Clan System is available for you to start organizing your own empire! To clear up some space here on the GoG homepage, we've archived all the video game tournaments and events for you to check out! The link to this archive is below and it is the place to check out highlights from th 30+ video game events and tournaments we've been a part of. Check out tons of photos and short stories, as we share where this video game community and our Video Game Event Management has been since 2007. Welcome to the Worldwide Gathering of Gamers! Get Started With Your Own Video Game Website Today! Welcome to the Gathering of Gamers! We know how much you love video games, so we’ve developed the world’s first community just for video gamers. Join the gathering of a worldwide community of people that love to game. No matter the hardware or the software, we have developed an online gamers community unlike any other, which invites video gamers of all types to unite. You’ll have the tools in your own profile to connect with the video game community like you’ve never seen before and the best part…it’s FREE! Sign up today and you’ll soon be enjoying a fully customizable profile that allows you to upload your own photos and videos, share your video game reviews and stories, access gaming resources from around the globe, and share your gaming world with our world! Join Your Fellow Gamers Online! There are 8210 total registered users. There are 392 registered clans. Search for your clan! Have you noticed the Chronicle tools you have in your profile? These are for you to rant and rave about virtually anything. Whether it's video game review, a secret video game strategy/cheat, or anything else, this is your world! The interesting part is that the community can come and rank your Chronicle posts while they comment on what you've written. Be careful though, because you can only rank/comment on a Video Game Chronicle once. The top 25 ranking chronicles will be highlighted on the Chronicle Ranking Page for all the world to see! What does this mean for you? It means you can become a video game critic, with the power of The GoG behind you. Along with managing this powerful video game community, Jet Set Studio also offers unique Video Game Event Management! This professional service ranges from developing an entire gaming event, to adding a neat video game element to your organization's existing event. We've worked with top companies such as Microsoft, BlackBerry, Massive Inc., Brocade, and many others. Our GoG Video Game Event Blog is a neat collection of photos and short stories surrounding the 30+ events we've developed and been a part of the past 3 years. Check out the JSS company website for more information and contact us to get the conversation started. We look forward to conceptualizing your event, sharing information about our equipment/experience, and also providing your organization with a formal proposal soon. We're excited about all the MLG focused content, profiles, contests, and conversations around this unique video gaming community. Look for additional things coming soon, but along with the MLG Sponsorship Contest you may have heard about, we're proud to announce a dedicated area to chat Major League Gaming in the GoG Forum! We've developed lots of cool GoG Banner Codes for you to use around the Internet! They can all be used to spice up your Facebook, MySpace, Twitter, or website where you'd like to represent this unique video game community! Do you want to make a name for yourself and get more involved here? The Elite Squad was specifically designed with you in mind! Elite Squad members take charge and show a willingness to take on other responsibilities and accomplish any task. We want gamers like you to step forward and drive this community. Whether it's spreading the word throughout your community, posting on hidden forums, staying active, giving us ideas for future development, or even keeping an eye on the content of this unique community for gamers, we want you to join us! Join the Elite Squad and let's show you how legends are born! Setup an account quick, make it match your GoG profile, and get to trading...it's easy, cheap, and fun...plus you have the confidence of knowing the people you're trading with are also members here. If you run accross a non-GoG member, take the opportunity to us your Referral Code! Even though we've been online for years now, we're still polishing and enhancing this monster, so your help is still appreciated. If you're using the tools and toys here and you see something that looks to be in error, please let us know! You can Report A Bug, or use the Contact Form to do so. Describe the issue you're having and we'll get it fixed. We want a complete and polished website community for video gamers and your bug reports will continue to help us do that. Instead of searching for customers, why can’t they just find you? Ever want to be in the video game industry? How could you help run our premiere video game tournaments? Could you bring new members to this video game community? Perhaps even sell banner ads?